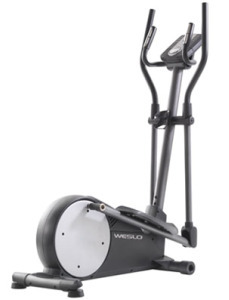 The budget-priced Weslo Momentum CT 5.9 elliptical offers a basic control panel, 14" stride length, and six aerobic workouts. Across three LCD display windows, the readouts show speed, time, distance, calories, and resistance. The Weslo Momentum CT 5.9 elliptical has six pre-set programs designed to adjust the resistance level automatically while you work out. The tension on the Weslo Momentum CT 5.9 elliptical trainer is set so high that it can actually give a killer workout, but that is the best that pro trainers and technicians can say about this machine. As for ergonomics, the 14" stride length is short and choppy so it feels more like a stepper than an elliptical. Weslo rates the CT 5.9 for riders up to 250 pounds but that is unrealistic for this 117-pound trainer that can feel wobbly on a carpeted floor. As a rule, you should not buy an elliptical trainer that weighs less than you do. There have been a few elliptical reviews written by owners of the Weslo CT 5.9 with comments that range from satisfied to raging hate. If you are a very light and small person (5'2", 115 lbs), you might very well enjoy your daily workouts without major issues. But don’t hold your breath. Other reviewers remark that they have had plastic parts break soon after purchase, and the console fails at around six months. Calls left at customer service are ignored. When owners attempt to replace an item on their own, they find that replacement parts cost as much as the elliptical trainer itself. The 90-day warranty is no help at all since it should hold together for at least 3 months anyway. After that, you are on your own. Even for the low price of $299, you think they could make a better machine than this. There are too many issues with the Weslo Momentum CT 5.9 elliptical: the heart rate monitor doesn’t work, the tension is very high making it hard to peddle the first few days, and the digital resistance often fails to adjust the tension (it feels the same at level 10 as at level 1). One of the more annoying things is that it eventually gets noisier the more you use it. The bushings will have to be greased every few weeks once the squeaking and clunking starts. We recommend you pass on this one as there are better cheap ellipticals out there.